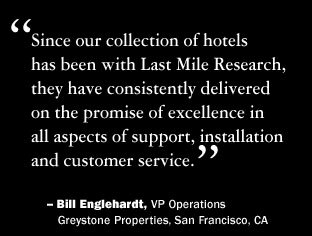 Last Mile Research engineers, installs, and supports digital media solutions for the hospitality industry. Our Network Solutions for high-speed internet access (HSIA), high definition television (HDTV), video on demand (VOD) and IP Telephony help hospitality property managers improve guest satisfaction and capture new revenue streams. Our clients rely on our deep knowledge of broadband and media technologies to help leverage their digital assets for maximum value. Not only will we design, build and maintain your system, but we will provide world-class guest support services. 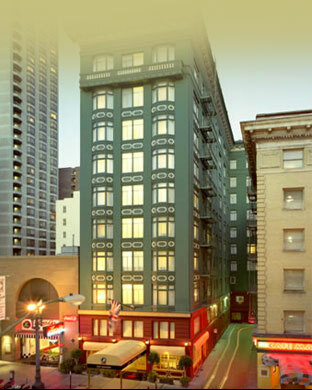 As hospitality property owners ourselves, we know that there is no substitute for extraordinary guest service. It’s all about the guest. Mike Pogue is the founder and President of Last Mile Research. He grew up in the hospitality business, helping build and operate his family’s motel on Route 66 in New Mexico, a property he now owns. Prior to Last Mile Research, Mike co-founded Angel Capital Network, a venture investment bank based in Sausalito, CA that matched early stage technology companies with seasoned angel investors. As president of Rabbit Ears Productions, he built the children’s entertainment company into a perennial award-winner, forging production and distribution agreements with SONY, BMG, Rhino Records, Windham Hill, Showtime, Simon and Schuster, and PBS. It was while at Rabbit Ears that Mike first started producing television programs in HDTV for the Japanese market in 1991. Earlier, Mike helped build the institutional investment research firm FactSet Data Systems Inc. (NYSE: FDS) from three to 200 employees as its vice president of sales and marketing. John Cascio is Director of Engineering, and oversees all network system designs, implementation, and engineering support at Last Mile Research. John is an expert on all facets of digital technology and providing carrier class, durable Internet systems to high-end hospitality clients. John’s early career began in the design and engineering of computer hardware and software diagnostic tools. He learned the importance of delivering “mission critical” systems while working for the U.S. Marine Corps, where he developed battle-tested frontline management systems. Later, as a senior executive with TekServe, John developed “networking swat teams” for Pac Bell\SBC that revolutionized their internet network support infrastructure. Kath Thomas is CFO and Director of Operations. She is our manager for job site coordination, bids and contracts, billing, accounting, and support services. Kath is a CPA and was general manager of a manufacturing company prior to joining Last Mile Research. She has over thirty years experience in business, the last fifteen in telecommunications, including technology research and analysis, regulation, public policy, government, and business management. Kath has a strong commitment to providing service that delights our customers.